This 1936 Bentley 4-1/4 Drophead Coupe by Park Ward belongs to my friends Rick and Sandy. Rick asked me to help him put his engine back together. He's rebuilt the engine once himself and put 25,000 miles on it thereafter. It began to exhibit unacceptable oil pressure, so a rebuild was in order. He asked me to give him a hand to speed things up a bit and said he wouldn't mind if I took a few photos. This engine is the slightly older and more complicated sister to the Wraith. Should be interesting. If you followed the saga of the Wraith engine rebuild, this should look awfully familiar. This is the upper half of the 4-1/4's crankcase turned upside down. You may notice that the engine mounting arrangement is different and the water pump and distributor are on the opposite side. The old center main bearing disintegrated. Like on the Wraith, these bearings are Babbitt material on steel shells. The camshaft has been reground to its original profile. The aluminum bearings are oiled through four holes in the little corner wells, instead of through the hollow retaining dowel as on the Wraith. The halves of the bearing are held in place by a pair of screws rather than a pair of wire clips. The front bearing assembly for the cam includes three spring-loaded roller followers spaced 120 degrees apart. These ride on a large bronze hexagon on the back of the cam wheel. Presumably this "cam balancer" eliminates hysteresis in the cam timing? I will look into that and report back. Installation of main bearings and the crankshaft is identical to the Wraith except that the Bentley uses shims to set the "nip" or amount of compression that the main bearing caps apply to the bearing shells. And just like the Wraith, the bearings are installed, set up with the correct "nip" and then line bored by a professional. We merely disassembled, double checked the bearing clearance and "nip" and then reinstalled with the crankshaft in place. Next, a spring is added to create some preload. Rick lets me do all of the fun stuff! I went through and measured the clearance of the pistons to the cylinders. All were 0.002 inches. Rick bought a new block and pistons from Fiennes Restoration, so no variation was expected, but it does not hurt to check. Rick also bought a new cylinder head. Very nice. ... and pushed in with a piston the same amount, in this case, up to the relief cut on the side of the piston. Even though Rick and I used the same supplier for rings and pistons, the ring gaps here were relatively large compared to my experience last year: 0.016 for the top ring and 0.008-0.014 for the middle versus a spec 0.008-0.010 and 0.006-0.008, respectively. This is out of Rolls-Royce spec, but since these gaps are typical for engines of similar bore size, we're not going to stop progress. Meanwhile, Rick has painstakingly installed all of the studs. The studs come in two lengths rather than three on the Wraith. And all of the longer ones go along the intake side: much easier to figure out. The block is now in place on top of the crankcase. Our friend Todd popped in at the right moment to give Rick the last few studs he needed plus help gingerly lower the block in place. I also removed the rods from the old pistons and installed them on the new. I had to heat old and new in a shallow pan of hot water so that the gudgeon pins would slide out. And the new rings have been installed. As on the Wraith, we're using post-WWII Bentley Mark VI rods that incorpate modern bearings. There is a tiny drilling half way up the rod which serves as a oil spray nozzle. This needs to be oriented towards the thrust face of the cylinder wall which is on the driver's right (off-side). Rick checked the end play of the camshaft and it came in around 0.010". The spec is 0.004-0.005"
End play is controlled by packing washers on either side of the front bushing that is part of the cam balancer assembly. Rick ground a new packing washer to the desired thickness to net 0.004" end play. The cam gear slides onto a taper and Woodruff key arrangement. The large threaded item is reversed threaded and allows the smaller attaching nut to rotate in place and serve as a built-in gear puller. The Wraith has no such arrangement and required the use of a gear puller. The back of the cam gear contains the hexagonal element previously mentioned with regards to the cam balancer. This is what the three spring-loaded rollers ride on. This gear is oriented relative to the cam lobes so that it is on an upward slope while the cam is on a downward and vice-versa thus reducing torsional vibration of the camshaft particularly at low speeds. This is one of the three roller assemblies that attach to the cam balancer and ride on that hex. There is a "grenade pin" feature which allows you to install the follower in a fully compressed state into the cam balancer and in turn install the cam balancer onto the crankcase followed by the cam gear onto the camshaft. Once the cam gear is in place, the grenade pins can be pulled through the larger holes allowing the followers to come into contact with the hex. The spark plug holes on the head have copper threads. The Wraith gets by with cast iron. With the block on it's side and looking in from the crankshaft side (foreground, out of focus) it is prudent to lay a straight edge over the copper oil line so that the connecting rods do not hang up on it as the piston assemblies are installed. This oil line is not present on the Wraith. The Wraith oil gallery is all external to the block and installed in one piece. The engine now has a full complement of pistons. Even though both of our engines have been converted to use Mark VI connecting rods, the ones on this engine use 3/8-24 UNF rod bolts whereas mine uses 5/16-22 BSF. The rod bolts on this engine are made to the same high standard with all of the little necks and tangs found on the smaller version. Must have changed design at some point. As with the Wraith, this is a game of getting the correct rod bolt stretch while aligning the cotter pin hole on the bolt with the castellations on the nut. This is as close as we're going to get without resorting to the surface grinder. Rick forces oil into the oil gallery and crankshaft with air pressure set at 30 psi. The Swepco 306 oil is tinted purple which makes checking for adequate lubrication at each bearing and leaks elsewhere much easier. There's a small internal leak on the inside of the crankcase where the oil is fed in from the oil pump. We haven't determined if this is significant enough to warrant a fix. ...followed by the head itself which is torques down to 21 ft-lbs. in stages. This is about as far as we're going to go on this engine for the rest of the year. Gladys has a spare 4-1/4 engine installed for the summer. We will reconvene in seven or eight months. You may recall we stopped work on this engine for the season. 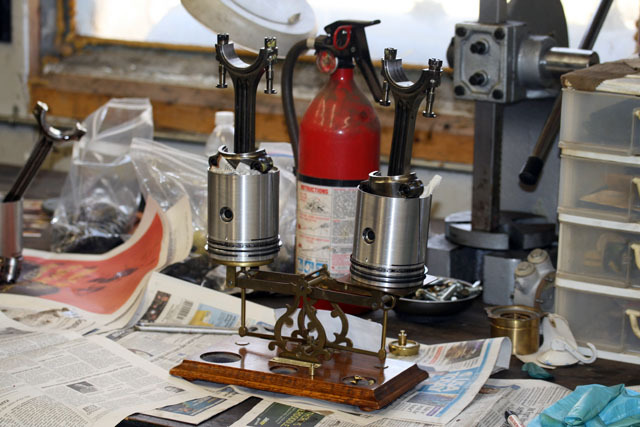 One thing we did not do was to ensure that each piston assembly weighed within 5 grams each other. We removed and measured them today. They were 9 grams apart, so Rick is going to send them out to be balanced.